The 2018 North American International Auto Show was the year of the pickup truck. And a 2019 Silverado rival emerged from the auto show, that is the 2019 Ram 1500. Ram has often been a distant third in the full-size pickup truck sales race, but the truck has become increasingly competitive with Chevrolet and GMC in recent years. For its redesign, Ram has high hopes. We found two major areas where the Ram 1500 and 2019 Silverado really choose different paths. Foremost, the Ram boasts a 48-volt belt alternator hybrid system dubbed “eTorque” for both the 3.6-liter V6 and 5.7-liter Hemi V8 engine options. The system electrifies Ram’s bread-and-butter pickup and provides an additional 90 pound-feet of torque temporarily with the V6, and an extra 130 lb-ft with the V8. Chevrolet did not reveal any electrification plans for the 2019 Silverado—at least not yet. 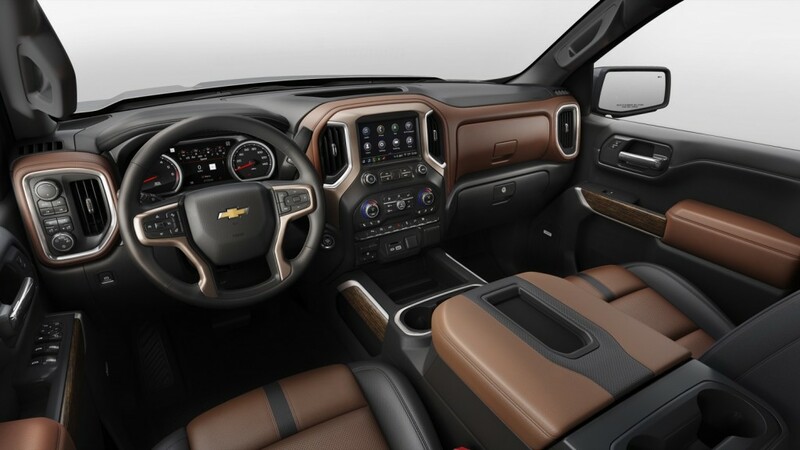 The other major area where the 2019 Silverado rival differentiates itself is the interior. We’ve heard a lot of comments about the Silverado’s interior, and most of them argue it’s not enough of a departure. While it may be functional, Ram’s interior does have more of a sexier appeal. 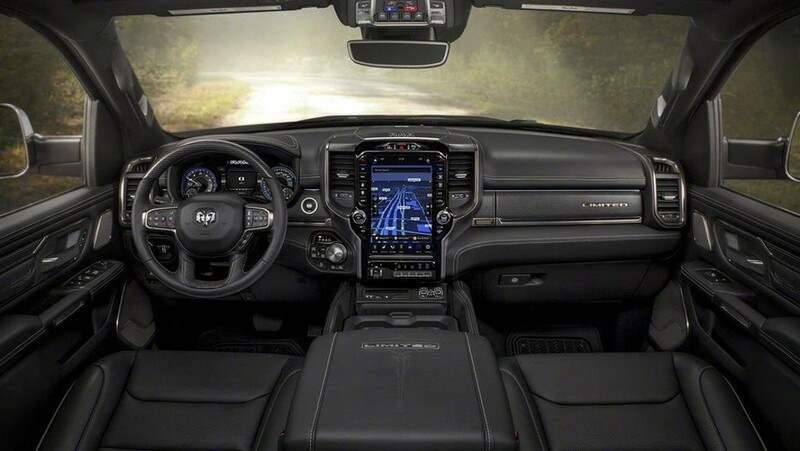 In fact, a 12-inch touchscreen that flows down the center console is an option with the 2019 Ram. As luxury pickups become a real money maker, the Silverado High Country may seem less attractive in the eyes of a fresher fully-loaded Ram interior. But, we digress. Ram’s new pickup will begin shipping during the first quarter of this year. 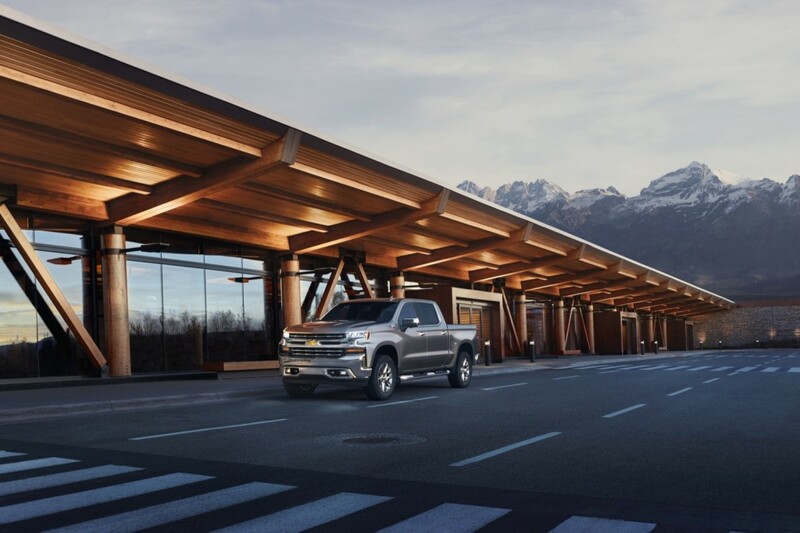 We’ll have to wait until late 2018 to see the 2019 Silverado show up at dealerships. I agree with Motor Trend’s first impressions of the two trucks: “Chevrolet built a better Silverado, but Ram stole the show with a forward-thinking truck.” There’s no doubt this is the best Silverado ever, and I’m glad to see GM push the envelope in innovation, design, and features in making the Silverado more competitive than ever! But I confess that the RAM does hold just a tiny sliver of more appeal to me with it’s cleaner design, interior layout and features, and mild-hybrid powertrain options, which I’m certain GM has in the pipelines with the new Silverado! All-in-all, now is the best time EVER to be a truck fan! All 3 American brands have made pickups the go-to market! No need to debate about who’s better! There’s simply not a bad truck out here! The big difference is Ram released all their info and Chevy released very little. A bigger splash, but Chevy built a better truck from what we do know. Rams headlines are a big screen an a Hybrid. We know the rumor that the Denali has a big screen too, they’re probably just saving the Uber options for the unveil of the Sierra. That’s not saying it won’t be an option on Chevys, but it may be Denali specific. The hybrid system Ram is deploying sounds like the same eASSIST that GM already offers on their 1/2 tons. Made in the USA Again: Fiat Chrysler Moving Ram Truck Production from Mexico to Michigan. GM moved production back from Mexico or stopped it from moving there regarding several models. Let’s GM takes notice and doesnt screw us with Mexican-made trucks. You say “luxury pickups become a real money maker” then mention Chevy. You are forgetting that GM is also developing the GMC Sierra as well and will make an appearance sometime this year. GMC is making a name for itself as the luxury truck brand. The reality is GM is a follower when it comes to innovative new features on modern pick-ups. Some new ideas and features make a bigger impact than others and some are certainly not well executed but Ford and Ram are willing to take more chances and it can pay off. GM plays it very safe and conservative. They still sell plenty to loyal “my brand” buyers, but they also are more exposed when Ford or Ram hits a home run. They may not market their innovation well but most of Rams innovation was on a Chevy truck first. Rambox, coil rear suspension were on the Avalanche dar dar before the Ram. They’ve also made hybrid trucks and their most current version from a few years ago is the same as the all new Ram. The bankruptcy set them back and they had a shortened design schedule and were not calling the shots for the 2014. There is far more to come than what we have seen with the 2019s. I have listened to all the hype that the press releases say and analyzed some of it to say it’s still nothing great. For example 7000 owners is about one percent of your sales. Whoopee I think everybody does that. A roll formed bed is cheaper than a die formed bed. When you reduce weight and thickness using steel you have to use a higher strength steel. When you bad mouth a competitor for using aluminum for pick up box and you produce an aluminum tailgate which takes more abuse seems hypocredical. Yet finally Chevrolet has an intregal structural front end structure and nothing is said. Oh yes the competitor has had that for the last decade. Styling is evolutionary. Overall still a nice truck. The BK and subsequent control by government bean counters was an excuse, it is no longer. GM is in a far better position to offer more innovative products than any other maker, but they play it very safe, conservative and arguably boring. A horsepower and MPG boosting Hybrid system, with minimal weight gain, is what makes sense for all pickups. I’m a Chevy guy and love the new Silverado, but GM needs to put its best things on Silverado as well, not just in the Sierra, as Ford puts on the F150. The new interior of the Silverado looks outdated compared to the RAM. Look at the detailing in the RAM; stitching, materials, colors – especially on higher trims, and compare to the Silverado High Country. The Chevy looks plain in comparison and like most of GM’s highest trim levels, you’re only getting “patches” of upgraded materials strategically placed atop the surrounding ho-hum materials. GM thinks this is enough to fool consumers and justify huge price premiums for Denali, Avenir and Platinum-spec vehicles. They simply need to do better. Let just wait till the intro in the fall to judge GM on their trucks. We still have the GMC, We also will have a trickle of news on things for 8 months to come. GM has already done the Hybrid deal and they have done many other things but in the end GM will do fine with the present trucks with out trying to be over the top on a few items. Case in point. Yes Dodge has the storage boxes on their truck. GM now has them but they are not only taking up the same space but can be removable for the owner on this truck should his needs change. Also it does not take a special bed to add them. This not only makes them more flexible but also more cost effective for GM as only one bed is needed. That will make them more money in lower cost and the ability to add them to any truck even as a dealer installed option. As for the Aluminum. GM used it in the most effective places and not all over. This not only makes for as stronger bed but also helps control cost in MFG. This is better for the Customer and better for Profits. The GM trucks in the end I bet will sell in just as great numbers and will in the end prove to be more profitable with the new ways GM is working to be cost effective. As the norm brand loyalty will hold tight and the defections will be small as they always are. Most people buy Ram mostly because it is cheap and you get what you pay for and most of them really pay at resale or trade time as they take a major hit. While I appreciate the look of the new Ram’s exterior, that 12″ screen has WAY too many buttons and info, giving it a confusing, overly busy look. GM’s system is far cleaner and easier to use. Look at the maximum tow capacity of Ram’s new truck-for a Crew cab , 4×4 with the 5.7 L Hemi etourque, probably the most popular build these days-just over 8,000 lbs! While their Quad cab 4×4 with same engine can tow over 10,000 lbs, it won’t be roomy enough for most families, especially if car seats are involved. That’s pretty pathetic for a 1500 with a v8 engine-in comparison a Colorado diesel can tow up to 7,700 lbs. Ram is also offering a rear diff cooling and heating system whereby engine coolant is piped to the rear diff-can you spell future coolant leak problems for trucks driven off highway on gravel roads? No corner step bumpers on the Ram even still, love them on my GMC since they make using the truck that much easier. Ram makes a pretty truck, but GM makes it pretty, rugged and capable ! You are incorrect on those tow ratings. The current Ram Crew cab with Hemi and 3.92 axle can tow 10,200 pounds and I see where they are rating the new truck at over 12 and using a Dana 60 center section which is SUPER strong. The 12,000 lbs plus rating for the Ram is the new Max Trailer Package and is only available on a 2wd, 3.92 axle with an OPEN rear differential. Yes, open rear diff on a 2wd made specifically for towing. Wow, that one-wheel-drive truck should be great for pulling trailers out of mud, snow, on ice, etc. I was using Ram’s own figures, so if incorrect , that’s their bad, not mine. The new Ram has a deployable rear corner step that is much easier to use than the fixed bumper “pocket” step on the GM trucks. That step has been a Mopar accessory for years now. Just not a feature you can click and add to a factory order. Not cheap either. Now late introduction. Meaning just don’t select it or the order goes stale. I personally don’t like the interior in the new Ram. In my opinion it looks overly busy. Sure, it offers a huge screen but is it really a necessity? Whenever I drive my dad’s f-150 which has (approximately) an 8 inch screen, I never think “wow this interior would be so much nicer and more functional if the infotainment screen was twice the size”. In my opinion an 8 inch screen is the perfect size. All the functions are in a small enough space that they’re easy to find, but not so small that the buttons end up being too small. And maybe the Ram is more luxurious but I think to the new Silverado offers more useful innovations for the average buyer. For example, the wider bed which I think is a real game changer, and then there’s the cubbies behind the rear seat backs. This Silverado addressed all of the complaints about the old one (including the square wheel wells even though everyone seems to miss them all of a sudden now that they’re gone) and kept nearly everything that people liked about it. And seeing that GM hasn’t released towing or payload numbers, I am pretty confident that they will one Ram’s numbers. This is a disappointment for RAM. – They only took 225 lbs off a heavy truck, so it now weights as much or still more than the current GM’s, and hundreds heavier than the new GM’s and Ford. – Interior and exterior are more updates than new. The nose curves and drops so bad, I want to knick name the truck Gonzo. – The power chin skirt is great in theory, but it can’t be disabled (no button inside). So the regular skirt is around 10 inches off the ground, and this new one drops down to 6-7 inches of clearance at any speed over 35 mph. That should be great for hitting snow drifts on the highway. -heating/cooling the rear differential is cool, but is it necessary? I don’t know how many rear diffs are cooked if the owner is towing within the legal ratings for their truck. – Same box design, same rambox design, still no step assist at the back unless you buy a Mopar accessory kick down step. – Added a HUGE screen that is way to busy. Eight to ten inches is ideal. But all they did was increase the size and jam more icons onto it. Then they stick the redundant buttons along side the screen vertically, so the driver has to reach across the dash to reach the vent selection buttons and the passenger has to reach across the dash to access the fan control buttons on the other side if they have gloves on in the winter. – Otherwise, they only did minor updates to interior, frame, suspension, in-floor storage, rearrange the centre console storage, 8-speed had programming added, and added things other trucks have had or will have such as the safety systems (blind zone alert, etc), power release tailgate, surround camera, etc. At least they moved to 6-bolt wheels finally. Ram really brought nothing new for innovation to the truck industry. GM’s used various hybrid systems in their trucks (Hybrid and now eAssist). The fact they did ZERO to their engines tells me they have no way to improve the engines themselves over what they already are. Then they add a Max Trailer Package to get their 12,000 plus tow rating, but it is only on a 2WD, 3.92 axle with an OPEN rear diff. Yeah, open rear diff on a purposely built tow rig should really be able to get trailers, campers, etc out of the mud, snow, ice, etc with basically a one-wheel-drive. GM on the other hand, really changed their exterior. They redesigned the truck box idea so now a GM short box actually has more cargo room than Ford’s 6.5″ box. Added 12 tiedowns with 9 more movable, removable box storage bins, power release and lift tailgate, exterior work lights, 400 watt 110 outlet at the back, added carbon -composite rear leaf spring to reduce mass and tweak the suspension, updated/redesigned both the 5.3L and 6.2L and added skip fire technology to run on anywhere from 1-8 cylinders on every single engine cycle, plus added an in-line 6 cylinder turbo diesel (should be a good torque monster being an in-line) and added the 10-speed. And there is more to come yet for powertrains. Then they addressed customer concerns like rounding off the wheel wells, adding push button start, centered the steering wheel angle, moved the trailer tow controls (although I prefer the upper left corner), added rear HVAC vents and rear heated seats, and created a higher seating position. Yes, GM only evolved the interior by moving some thing around for ease of use, but it is a very clean look, and everything is well laid out and easy to reach and use. Then added hidden storage in the rear seat backs for additional storage room. There will be brand loyalists who will love their brand’s new truck, some who jump ship, and some who are new to trucks. But from what I’ve seen so far, Ram will stay a distant third in truck sales. -Deployable step will be offered as a factory option (in addition to a mopar accessory). Also, the air suspension kneels in park mode to allow much easier access to the bed and cab. There is also a lower step surface through the middle of the rear bumper compared to other trucks. This not only helps with bed ingress but greatly reduces damage from snow pack on the bumper when you drop your tailgate. -Cab is 4 inches longer than outgoing DS crew cab (with 225 lb weight reduction) making this the largest cab in the segment. Couple distance is nuts now as rear seats actually offer slouch position and flat load floor gives even the center occupant more comfort. Also, available panoramic sunroof is really nice. -Coil and/or air suspension is – hands down – the most comfortable ride of any of the full-size trucks. I have driven them all up and down hundreds of miles of dirt road and I can’t believe that GM and Ford haven’t relegated the “apple cart” leaf springs to the HD trucks (where you actually might tow 12,000 lb on a regular basis). pockets and fuel cap tethers. climates. Plus they leave the bumper surfaces clean and uninterrupted. it and shifted the front end up past the belt line and bodyside a-line. Seems disjointed. Just my .02. Air suspension sounds really good and does give the Ram a nice ride-but its been plagued by moisture issues and costs a bundle to fix. Its still coil spring under lower trims and that means a compliant ride at expense of max payload and squatting while trailering. I can agree with you about the whip antenna. The fuel door? GM has capless already-whether push push or finger grab really doesn’t make or break it for me. The new Ram looks nice for sure, but is it as capable for truck duties as other 1500’s in the segment? Time will tell. I think if it was a real problem FCA would have major warranty liability with it because it’s on so many vehicles. Bottom line is – if you lease – you’re always going to be in warranty. If you buy (any new vehicle with all the modern technological accouterments) you should just get a bumper to bumper lifetime warranty IMHO (mopar life care in the case of FCA product). Especially with the 7 and 8 year notes for new cars now. Makes no sense to have a payment and be out of warranty on vehicles as complex as today’s. The GM corner steps are brilliant-no moving parts, nothing to rattle or break and always accessible even with tailgate down, especially when a trailer is attached. I’m not seeing what all the fuss is on the Ra interior pic showed above. It looks like a boring all black coal mine with little to contrast. And that larger center stack and screen just makes it look busier. I think the new Ram also lost some of it’s character and looks more bland and plain. Take a look at the red & black Rebel interior or the navy blue & frost interior on the Ram and you will see they blow the Silverado away. GM has a terribly long history of penny pinching on interiors thinking nobody will notice.